Spanakopita or spinach pie is probably one of the best-known of all traditional Greek dishes and hands down one of the most delicious. Its traditionally made without cheese so, bonus, authentically vegan too! A handful of simple ingredients – fresh dill, mint, peppery chopped scallions, gorgeous green leafy spinach and you’re good to go. Wrap it all up in flaky fillo dough and you’ve got one of the easiest and most delightful foods in all of Greek cooking. 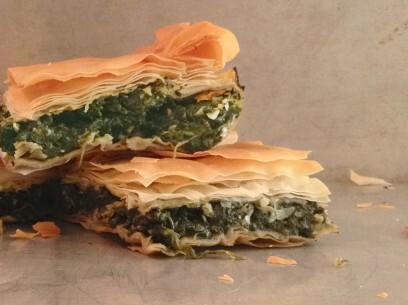 This recipe will have spanakopita on your table in under an hour. Give it a try, you’ll love it, I promise! There’s a little prep involved, its quick though, and the few extra minutes make a big difference in your finished pies. First, clean your spinach. 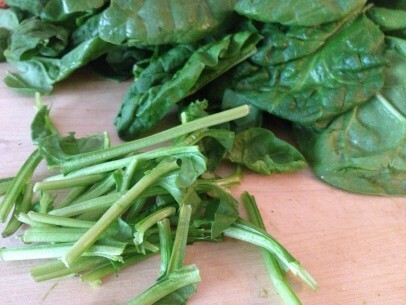 Trim the ends and rinse spinach really well. And I wait to chop spinach AFTER its wilted down, makes the job much more manageable! You certainly can use frozen spinach in this recipe and many people do. 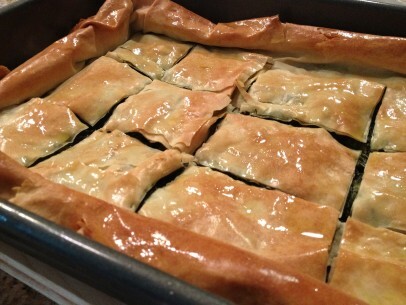 I just find when I use frozen the spanakopita is a little less flavorful and the color of the spinach is darker. If you do decide to try frozen spinach, remember to thaw it completely before using. 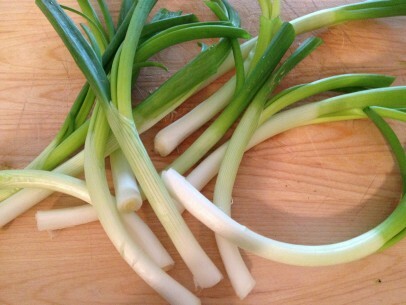 Clean your scallions before chopping them. This may seem silly to mention but I’ve found that many people leave out this step. Peel off at least one and maybe even two of the outer most layers as you would an onion. I like to leave the root end on while peeling so that the entire scallion doesn’t fall apart in the process. Once the outer layer is removed, trim off the very top, green ends and the root ends. Then chop scallions from white bulb up to the trimmed ends of the green leaves. I love scallions in this recipe because they add a peppery bite that you just don’t get with onions and they’re so pretty! 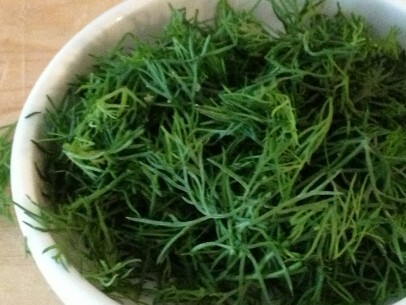 Fresh herbs really are a huge part of this dish so be generous with them! Chop both the fresh dill and fresh mint finely and when its time to add them to the pan, you just want to lightly heat them enough to get their oils out. Don’t be tempted to cook them, you want to preserve as much of the beautiful, bright, fresh flavors as possible! And wilt your spinach in batches. A tablespoon of olive oil to each batch of spinach in this recipe is quite sufficient. Again, don’t cook the life out of your spinach. For right now, just wilt it over low heat. It should still be a nice bright green color. You’ve over cooked if you start seeing it turn so dark green its almost black. So important, can’t stress this enough – once all the spinach is wilted, drop it into a strainer and let the extra liquid seep out. Gently use the back of a wooden spoon to press and get as much out as you can. There will still be some left and thats fine. Just remember that limiting the amount of liquid in your spinach is the best way to avoid soggy pies! I’ve probably mentioned this in other posts but it bears another mention – I love Fillo Factory fillo dough. If you can’t get it in your local area, you can easily order it online here. Its always fresh, organic, vegan and is an all around quality product – worth looking around for, I promise. I like to use the 14×18 sheets. That’s the traditional size but feel free to try the smaller sheets 12×17. They’re slightly easier to handle, especially if its your first time working with fillo. A good top and bottom number of filo sheets for a pita like this is 6 sheets on the bottom and 8-12 sheets on the top. I like to use a baking pan (9×13″ with 2″ sides) to make a pita to serve 12 snack or appetizer sized pieces and 6-9 large or meal size pieces. Use a light touch when brushing your fillo with olive oil. You want enough oil between layers to keep fillo light and crispy. Too much and you’ll get soggy, unpleasantly greasy layers. And remember to score the top of the pie before cooking. Makes cutting and serving SO much easier! Thaw frozen spinach completely before using. For both fresh and frozen spinach, drain spinach in a strainer (preferably over the sink) to get out most of liquid. Chop well and set aside. You should end up with 3 cups of chopped spinach. In 1/4 cup olive oil, sauté chopped scallions and garlic on low heat until soft, careful not to burn. Add herbs and spices, stir to combine well and cook on very low heat for less 5 minutes just to combine flavors. Add chopped spinach to pan and mix well to combine completely. Take your time with this step to make sure ingredients are evenly distributed throughout the spinach mixture. Cook on medium low for about 10 minutes, making sure to stir often. Remove from heat and set aside. When ready to bake, carefully separate and layer fillo sheets in baking pan and brush each sheet lightly with olive oil. An average of 6-8 sheets both under and on top of spinach filling is a good guide. Add the spinach filling and distribute evenly over the entire pan. Add top layers of fillo as above. Brush top of pie liberally with olive oil and score fillo sheets carefully cutting through all of the top layers of fillo. I use a box cutter and it works very well. Bake at 350 degrees for 45 minutes until a beautiful golden brown. Allow pie to rest for about 15 minutes before serving. To reheat, wrap in aluminum foil in 350 degree oven for about 15 minutes. Do not microwave or you’ll get soggy spinach pie! I love this post. 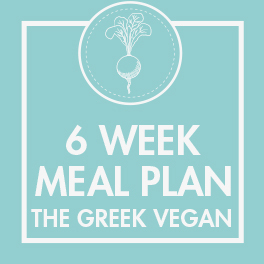 I am greek and also vegan and I’m planning on making this tonight…thanks. Just made your spanakopita and your milopita! In the oven! I am greek and vegan too. And I love spinach. Thank you for the recipe. This is a good recipe, I would add that if the spinach is left in a colander overnight to drain (I stick the handle of a wooden spoon in it to help it drain and refrigerate) the results are more predictable. Kalo Pascha . thanks for all the recipes, I’m not vegan….but have been fasting for 40 days, these recipes were great! I am a Greek American and vegan. While I started with a colander and a wooden spoon to help remove the liquid, I ended up getting great results by using my salad spinner. It was fast and removed a lot of liquid. I am so glad I found your website. EXCELLENT RECIPE! Made this last night. Used shallots mostly because I had them in abundance. Did not have enough spinach. DELICIOUS nonetheless. Used fresh baby spinach and tried to remove all stems; gave up on that. Even with a tired cook and using my hand to put the olive oil on, WONDERFUL SPANAKOPITA! We have never had it this way, with no feta. Will make this recipe again and again and again. I am very popular in my household right now. THANK YOU. My Cretan mother always put a 1/4 cup of par boiled Uncle Bens rice in her spanakopita — absorbs the moisture from the spinach? I make this all the time ,but i fry some onion as well and add rice to absorb the spinach. I rarely comment online,, but have to say, what a well written recipe! This would be perfect for someone just starting out cooking, love all the basic details that many recipe writers assume everyone knows! I’m Orthodox and always looking for vegan recipes! Is there a substitute to Olive OIl that you would recommend? I made it for my son for New Year since he is vegan and I am Greek. He had to find the coin. He made his own cashew cheese, and I used it instead of feta. I did add salt to the spinach and used no dill. I did use vegan butter. Absolutely delicious. Is it possible to freeze these either before or after cooking? Thanks! I have a gorgeous recipe where you skip cooking the spinach but massage olive oil, salt flakes and lemon juice into spinach, chopped leeks, spring onions until it wilts – almost instantly then proceed with the filo – also sprinkle cooked rice on top – just a little bit. This technique works for any chopped vegetable for salads. Fiona that really sounds interesting! but can you explain how to ‘massage’ the spinach? I’m assuming everything in a large bowl and mix with your hands? Sorry for the late reply Kiki – yes you massage until it goes limp which is just a few minutes – the lemon juice ‘cooks’ the other ingredients. This technique works with all vegetables for delicious raw salads. This looks amazing! Does it make just one 9×13 pan? If so, do you cut each 18×14 phyllo sheet in half to make one layer or does one sheet folded in half equal a layer? What did those who already made this do? Thanks! Can’t wait to try this! I made this last night with a few adjustments and it was so yummy and even better this afternoon when it was cold! I didn’t have enough scallions so I did half scallions, half onion. I also added nutritional yeast, which gave it that nutty, warm flavor. I also did individual roll-ups rather than a whole pan. It made it easier to be finger food, I feel. Anyways, thank you for sharing this recipe. It was absolutely delicious. And I am telling my whole family about this blog! This blog and recipe made my dreams come try. My yiayia’s and pappou’s looked at me like a crazy person when i went vegan. I cannot wait to make this for them for Easter! Thank you so much! Thank you for this lovely recipe, I’ve made it twice now. The only issue l have is that the outside and corners of the filo seem to get dry and crumble when l fold them all into the middle at the end, do you have a solution for this? Your corners look so smooth and professional when you do it. I cover my the stack of unused filo with a dampmdish cloth to keep it from drying out whike i work on the pie. Haven’t made it yet, but most definitely will, and soon – I see this as part of my Yuletide feast, together with a vegan kleftiko (“lamb” roast) recipe I’ve found elsewhere! Greek food is one of my ultimate comfort foods, especially two items in particular. Gyros (of course – hey, I DID live in North Side Chicago after all), and spanakopita, which I’ve often had as a meal rather than just a side! Can’t do baklava with the rose water, though, but make it orange water? Oh, yeah! I didn’t know that spana’s not traditionally made with feta! Everywhere I’ve had it, it had cheese. I’ll have to try it this way! Thank you! You have made this relatively new vegan quite happy again! I just made this! I added my homemade cashew cheese to it and wow! came out amazing! I don’t measure but used soaked cashews (i soak raw cashews in boiling water for 15 minutes), water (less=thicker consistency), 2-3 cloves of garlic, and some vegan lactic acid (you can sub lemon juice but I find the lactic acid makes it taste more “cheesy”), salt and pepper to taste. I put it in a food processor with some of the scallions and dill for more flavor and mixed it with the spinach mixture. How much garlic would you advise to use here? Thank you for your yummy blog!